I feel as though Nancy Silverton and I go way back except that, of course, I’ve never met her. In 2007, I read her Breads from the La Brea Bakery book and soon thereafter made my sourdough starter that I still use today. I’ve made many of the breads from that book and have even gotten comfortable adjusting recipes here and there. I make a whole grain version of the bagels from that book. And, it’s that voice of Nancy Silverton that I think I know, the voice of her writing from 1996 when that book was published. All these years later, the voice of her latest books is a little different. She’s having an amazing culinary career and experience and passage of time have brought clear preferences for certain flavors or techniques. Her latest book is Mozza at Home: More than 150 Crowd-Pleasing Recipes for Relaxed, Family-Style Entertaining , and I received a review copy. It’s full of recipes she turns to for entertaining both at her home in Los Angeles and at her second home in Umbria in Italy. The book includes nineteen different party menus with various side dishes that would go well with each theme or main course. If you’re planning a dinner party, you could pick and choose how many and which side dishes to prepare. Then, Desserts has a chapter all to itself. The idea was that most of the desserts could be paired with multiple menus, and you can choose from the whole collection. For main courses, the menus include dishes like Saturday Night Chicken Thighs with Italian Sausage, Sicilian Swordfish Spiedini, Dean Fearing’s Frito Pie, and Lamb and Chicken Tikka Kebabs. I got caught up in all the various salads as side dishes. The Farro Salad with Fresh Herbs and Feta is like a Greek salad with farro. The Couscous Salad with Root Vegetables and Ricotta Salata is perfect for fall with carrots, parsnips, and radicchio. And, there’s a Mixed Grain and Seed Salad made with quinoa, wild rice, and fregola sarda. I couldn’t resist starting with the Carrot and Rice Salad with Ginger Sumac Dressing for the seasonally appropriate color scheme. There are a lot of interesting things going on with this rice salad. Three different types of rice are suggested. You could limit that to one instead, or use two types of rice as I did. I used black rice and red rice and skipped the brown rice. Each type of rice is cooked separately and then cooled by spreading on a baking sheet. The second main ingredient here is the carrots, and they need to be cut into short julienne pieces. The process for cutting the carrots is suggested as follows: “cut the carrots into 3- to 4-inch segments. Using a mandoline, slice the segments into 1/16 inch thick lengthwise. Stack the slices and slice with a knife into 1/16 inch batons.” I employed the carrot slicing trick of making angled cuts that you stack and julienne rather than pulling out the mandoline. I don’t remember where I learned that trick, but it’s a great one. The third main ingredient for this salad is a whole cup of flaxseeds that were toasted in a dry skillet and cooled. The dressing was made with lime juice, sumac, champagne vinegar, grated fresh ginger, and red chile flakes. I believe there’s a typo in the book for the quantity of sumac. I used almost a tablespoon not one half cup. That was whisked together and set aside. 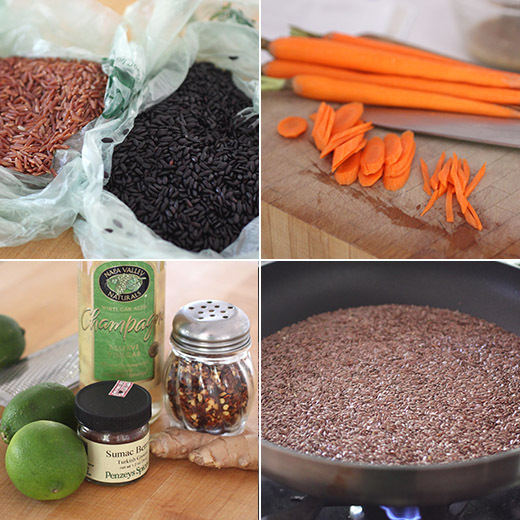 The cooled rice was combined in a big bowl with the julienned carrots and flaxseeds. The mixture was drizzled with olive oil and tossed to coat. The dressing was added, and the mixture was tossed again to distribute. The bright, zippy dressing livens up the rice and makes this a fun salad. The flaxseeds add a nice nutty richness to go with the freshness of the carrots. I’m not sure if I’ll keep working through all the salads I want to try or maybe move on to the Eggplant Lasagne next. Then, there’s the Desserts chapter to devour. For today, I’m happy to enjoy the orange and black of this dish. Happy Halloween! That looks so good! What a delicious combo. Great colours, texture and flavour..this looks awesome! Great salad recipes are worth searching for. 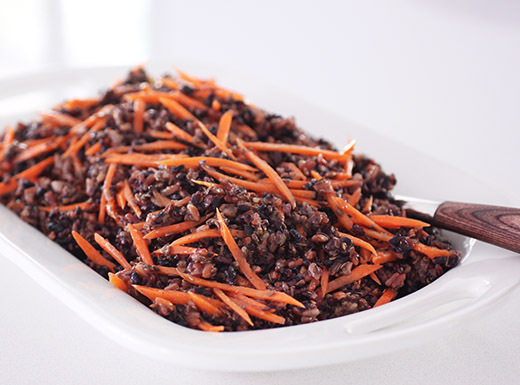 Using red and black rice really adds for flavor and texture to this salad, a vibrant fall recipe. 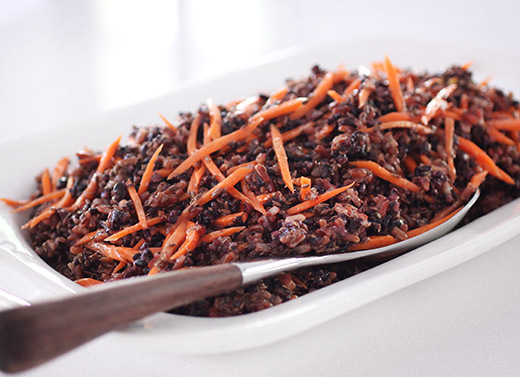 pretty sure i've never seen red rice, but i'd like to see it up close and on my fork! what a unique salad! I first "met" Nancy Silverton in one of Julia Child's cookbooks (from that TV series where she cooked with famous chefs). Always been interested in her cooking -- she has a lot of range. Anyway, this looks lovely -- thanks so much. Sumac is one of my favorite spices, love everything about this dish Lisa! Sounds like a terrific cookbook as does the salad. I especially like the flaxseeds used in the recipe. I must try that technique of doing the carrot juliennes- would save a lot of time. I'd like to see the chapter on desserts- I am definitely a dessert girl! What a lovely salad - definitely unique and love the use of sumac.